Elliot Ness and his crusade against Al Capone make for a great story. Several movies and series regarding him and his Untouchables pursuing bootleg booze and its purveyors sticks in the mind, heavily romanticizing the 20s in the minds of Americans and others alike. Naturally, it’s an interesting basis for a game, too, though Blues and Bullets send it off in a different direction. While its historical accuracy is questionable, the decision does have a certain appeal that carries into this noir adventure. 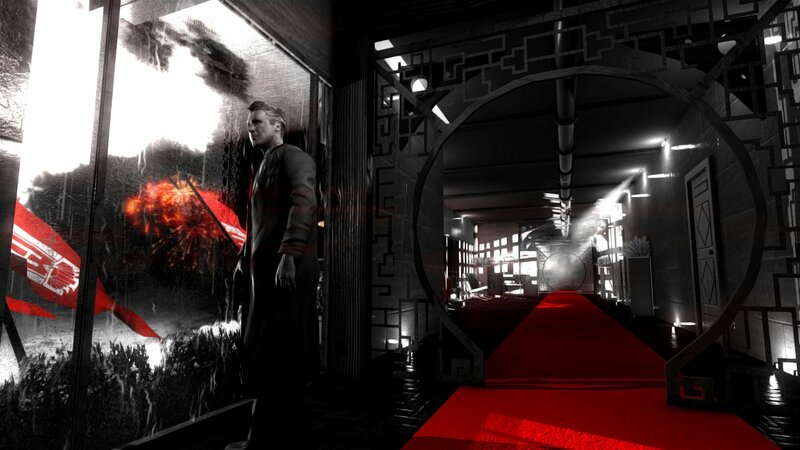 “Noir” is the operative word, and it really seems like A Crowd of Monsters was drawing on the movie Sin City for inspiration of art and tone. 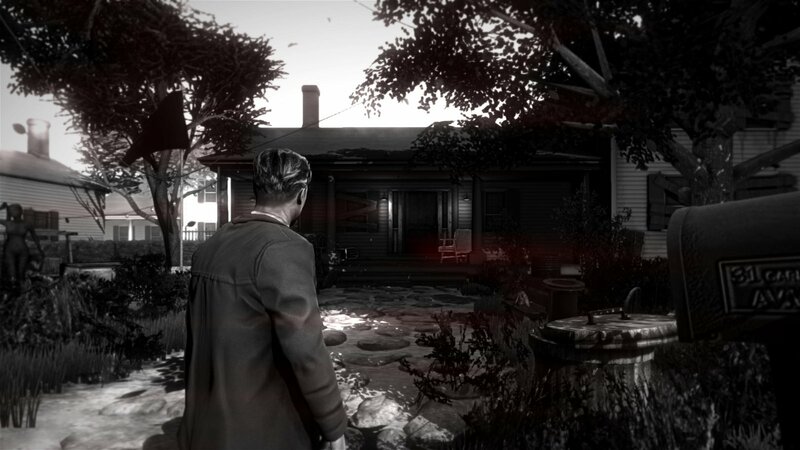 Everything in the game is a dark-toned black-and-white, with only certain objects receiving colour treatment — mostly the colour red, particularly blood. This helps it stand out, though the darker palette does make it harder to discern some environment features—particularly indoors—the game makes use of a helpful indicator system, where a large red eye symbol fades in over objects of interest as you get near. The film-noir style, complete with internal monologues and stark corruption, is suffused through the world, though it prefers to keep Ness’ musings short for the most part, instead showing his struggle with alcoholism and guilt through his actions and interactions with others. The style works well for the most part, with the highlight being the narration boxes being used as cover in a firefight, but the veers into pulp-novel territory can sometimes feel jarring. As Ness investigates the disappearance of a child, he finds himself in the Hindenburg Hotel, located in an airship moored high above the city below — a strange detour into alternate history that continues throughout this first episode of the series. I’m still not entirely sure what to make of it; smatterings of the occult, hints of strange conspiracies, and the entirely Untouchables back story make for a rather strange initial product. As this is the first episode in a series of what seems to be five or so chapters in the vein of other such adventure games, there’s not much to say other than the opening leaves us with a lot of questions and not many answers. It should be noted that the game is somewhat brutal, dealing with some rather raw issues such as child kidnapping and torture. While this might not be everyone’s cup of tea, the gore is handled fairly well, leaving out any exposed entrails or graphic acts of violence, usually showing the aftermath or working by suggestion. This game knows just how much to show, and should be praised for it. Gameplay resembles the adventure template set out by other games, such as Telltales gamut of interactive stories. Players move about the world, examining objects and speaking to people, given a couple of one-word descriptors to guide the tone and intent of their responses and actions. The game very clearly tracks some of these choices, listing your decisions (and a metric for how many players choose which actions, to which I am largely indifferent). Others have had minor influences, such as whether or not you properly prepare an offensive cop’s burger, or whether you allow Ness to indulge his infamous and ironic drinking habit (and whether you choose to lie about it later). These choices are clearly going to have larger repercussions later, though it’s hard to see how much they change within the scope of this first episode. I saw one major choice’s impact in my playthrough, as well as a few minor ones. Gameplay is more diverse than merely talking, and consists of two major elements. 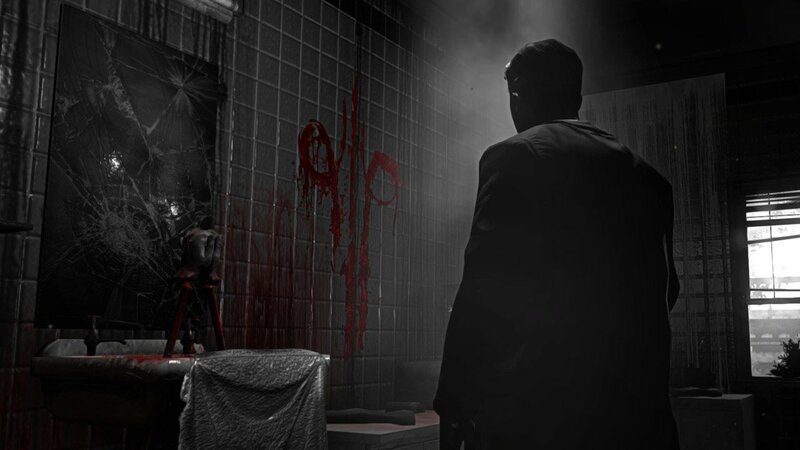 One, crime-scene investigation, is a straightforward exploration where you examine points of interest, and then assemble them into an investigation board of evidence, using them to reconstruct the crime scene. There are also combat sections, which are not particularly unique even in these games. Some of them involve simple quick-time-events (the great, hated staple of adventure games), that simply restart you at the beginning of the sequence if you fail. What caught me was the shooting sections — they consist of hiding in cover, poking out to aim and shoot down targets, occasionally being able to switch cover positions or shoot exploding barrels, and moving along to the next encounter when you’re done. It’s no Modern Warfare, amounting to a basic shooting gallery, and I never felt threatened by anything in it. However, both shootouts in this chapter were well-integrated with the story, and one employed a rather impressive use of surrealism, including physically interacting with the voice-over. Character voices are pretty spot-on, and the voice-acting in general is strong, with Ness sounding kindly but weary. The character models work quite well with the limited colour palettes, with only one character design feeling somewhat out-of-place (a figure with a bandaged face, somewhat contrived to allow for the chapter’s finale). The first chapter in a series, this game has to make a catching opening, and it somewhat succeeds. A few bizarre twists and noted historical mutations left me equally confused and intrigued — it’s enough that I won’t dismiss the game right off the bat, but I have a hard time fully endorsing a season’s pass just yet. We’ll have to see if the next episodes expand well enough on what’s been established to warrant an immediate investment. At six dollars, though, this is worth trying out. Naturally, it's an interesting basis for a game, too, though Blues and Bullets send it off in a different direction.